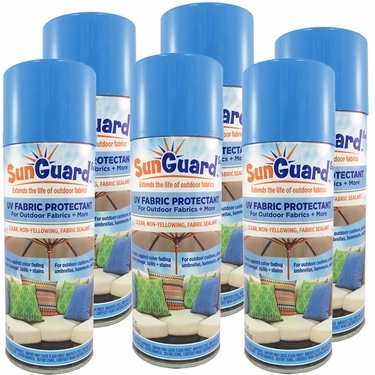 SunGuard Softi UV Fabric Protectant is a clear, non-yellowing spray coating that provides maximum strength waterproofing protection for indoor & outdoor fabrics such as cushions, pillows, umbrellas, hammocks, awnings, curtains, and more! SunGuard Softi contains strong UV inhibitors to resist color fading from the sun, guaranteed to extend the life of all your outdoor fabrics. This advanced formula penetrates below the surface to protect against moisture damage without leaving surfaces discolored, stiff or sticky! Coverage: Approx 60 square feet depending on the condition and porosity of the surface. Net Wt. 11.5 oz. For many years people had been asking us what's the best way to protect their outdoor products from fading. After a long road of research and development, in 2015 we finally launched our patented SunGuard UV Protectant with enormous success now found in garden centers nationwide! With plenty of support and huge demand, for 2016 we are just as thrilled to now launch SunGuard Softi, our Premium UV Fabric Protectant spray! This new product is amazing and will extend the life of all your outdoor fabrics. The product is non-yellowing and clear, it dries quickly, can be reapplied as needed, and there is no stiffness or stickiness feeling associated with it. Best of all if offers strong waterproofing and UV protection! Just like our original lab tested SunGuard for Decor, we could never claim this new Fabric formula to be stronger than the sun, but now you have the ability to renew that protective UV coating and feel confident that you have the strongest outdoor protection available on the market!